Roasted butternut squash falls into my "comfort food" category and although I cook with it year-round, I do find myself using it more frequently in the Fall and Winter. I love its creamy texture and flavor and layering it in salads is one of my favorite ways of using butternut squash. This dish is beautiful to serve over the holidays! 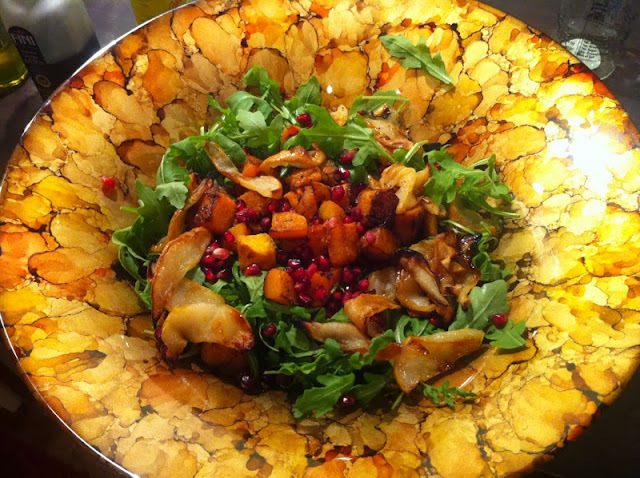 I created this salad with just arugula, butternut squash, pear & pomegranate seeds, but lately have been adding hearts of palm, feta cheese and pumpkin seeds. They add amazing depth of flavor. I've also switched out the pomegranate seeds for dried cranberries, depending what I have in the pantry. Dried cranberries are easier to find and are wonderful in this salad. I'm addicted to this combination right now! * the BEST Balsamic Vinaigrette dressing (in my opinion) is from Cooking Light magazine. This is my go-to recipe I use almost every time. Click here to view. Preheat oven to 425°. Line a baking sheet with aluminum foil and coat with the olive oil spray. Lay the cubed butternut squash in a single layer on the baking sheet and and sprinkle with salt & pepper (I use a 2 finger pinch of both). Coat squash with olive oil spray and/or drizzle with olive oil. Roast for approx 25 minutes until soft and slightly browned (caramelized). Cool slightly. Roast pears on baking sheet with aluminum foil coated with olive oil spray for 10-15 minutes until slightly brown (this is optional ... I love the extra flavor the roasting adds, but skip it many times as well). In a large salad bowl, layer the salad ingredients (arugula, celery, hearts of palm, squash, pear, pomegranate seeds, pumpkin seeds & feta). Drizzle with Balsamic vinegar or Balsamic vinaigrette dressing and toss until lightly coated. Enjoy! I buy butternut squash from Trader Joe's that has already been peeled and cubed. It makes this recipe fast and easy to make! Saveur Magazine has a great article on 10 varities of pears and their uses in cooking. Click here to read and learn more about this wonderful fruit.